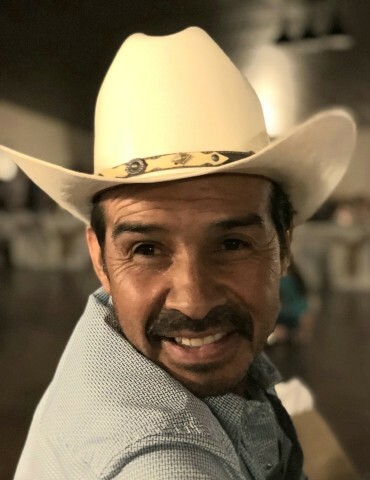 Bridgeport ~ Florensio Luna-Santoyo, 56, went to be with our Lord Monday, February 11, 2019 in Plano. Mass of Christian burial is 11:00 a.m. Friday, February 15, 2019 at St. John’s Catholic Church with burial in Thomas Cemetery in Bridgeport. Family will receive friends 6-8 p.m. with Rosary at 7:00 p.m. Thursday at Hawkins Funeral Home in Bridgeport. Father Thomas will officiate. Pallbearers include Martin Caldera, David Carrollton, Lucio De Loera, David Ibarra, Ivan Ibarra, Valente Ibarra, Don Tucker, and Johnny Williams. Florensio was born December 2, 1962 to Jose and Cruz (Ibarra) Santoyo in Zacatecas, Mexico. He was united in marriage April 1987, to Maria Aceredo in Corralitos, Zacatecas, Mexico. Florensio loved farming and animals, especially his beloved goats. He also enjoyed hunting, but his greatest joy was his grandson. Florensio was a devoted husband, father, grandfather, brother, and friend. Those left behind to cherish his memory are his wife, Maria Acevedo-Santoyo; his daughter, Domenica Santoyo and husband Justin Kyle of Decatur; his son, Acevedo Jesus Santoyo of Bridgeport; his daughter, Erika Deldadillo and husband Cesar of Bridgeport; his daughter, Yesenia Santoyo of Bridgeport; and his son, Adan Santoyo of Bridgeport; his grandson, Noel Kyle; his siblings, Antonio Santoyo, Argelia Santoyo, Jose Santoyo, Magadelena Santoyo, and Maricella Santoyo; numerous nieces, nephews, extended family, and a host of friends.